The Type BA BeamClamp is used to connect steel with parallel flanges. It has a recess to capture the head of a Grade 5 bolt. This allows the installer to use a single wrench for installation. The BA is available in three tail length, 1, 2 & 3. 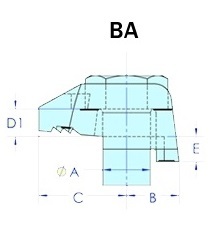 The tail length plus the thickness of appropriate packings BF1, BG1, & BH1 should be equivalent to the flange thickness being connected. See individual clamp page for tail length and packing combinations.